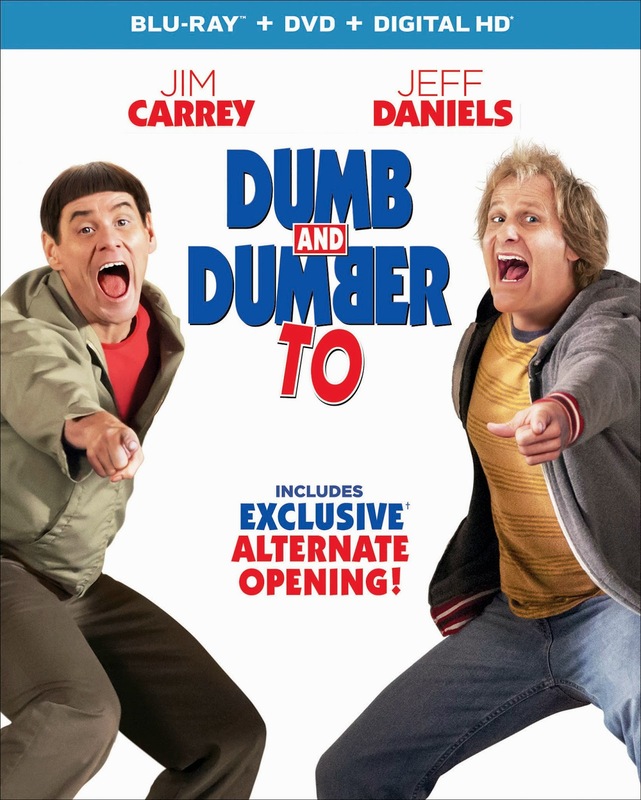 Two decades after Jim Carrey and Jeff Daniels’ endearingly dense pairing spun slapstick comedy into box office gold in Dumb and Dumber, the long-awaited sequel, Dumb and Dumber To, arrived on Digital HD on February 3, 2015 and on DVD and Blu-ray™ Combo Pack and On Demand on February 17, 2015 from Universal Pictures Home Entertainment. Directed by Peter and Bobby Farrelly (Dumb and Dumber; There’s Something about Mary; Me, Myself and Irene) the Dumb and Dumber To Blu-ray™ Combo Pack offers hilarious extra belly laughs including an alternate opening, deleted and extended scenes, and a multi-part feature that takes viewers behind the scenes of the no-holds-barred comedy. * What’s so Smart about Dumb and Dumber To? From stress relief to providing a new perspective on life, the film’s cast and crew and the author of Psychology for Dummies make the case for why you sometimes need to step back from the seriousness of life and just get dumb. * Chapter 1 – “I Like it a Lot” – The Beginning—Join Jim Carrey, Jeff Daniels and the Farrelly Brothers on-set as they give you the hows, whats, whys and huhs behind making dumb magic all over again. * Chapter 2.5 – “That’s Insane!” – The Cameos—Meet the fan favorites, powerful executives, brilliant musicians, and comedy legends who pop up throughout the film in surprising (and surprisingly dumb) ways! * Chapter 3 – “We’re Gunna Need Some Wheels” – The Cars— Take a ride on the Zamboni, go inside the hearse, and discover the story behind the triumphant return of the Mutt Cutts van in this fun piece! * Chapter 4 – “That’s Commitment!” – The Stunts— This chapter offers a high-paced peek into just a few of the hilarious stunts involved in the making of this movie. * Chapter 5 – “There’s No Diamonds In Here” – The Editorial—Step into the edit bay with acclaimed comedy editor Steve Rasch (“Curb Your Enthusiasm”) to learn about how some of the movie’s most memorable scenes came together. As fans of the comedy classic Dumb and Dumber know, life is always better with a buddy. To celebrate the February 17th release of the hilariously over-the-top sequel DUMB AND DUMBER TO, here's a look at a collection of unconventional dynamic film duos who are no less memorable! A friendly but lonely young ghost named Casper (Malachi Pearson) befriends a friendly but lonely young girl named Kat (Christina Ricci). The result is anything but an ordinary friendship. Filled with laughter, excitement and ghostly surprises, Casper and Kat are a true tale of young friendship and a bold display of the bonds that hold us together. Inspired by “The Blues Brothers” musical sketch from Saturday Night Live, John Belushi and Dan Aykroyd are on a mission from God to bring the Blues Brothers Band back together. Emerging from several deadly situations and an epic car chase in a race to get to Chicago, comedic legends Belushi and Aykroyd charm with the complete and utter nuttiness that ensues along their journey of one last good deed. One person will win Dumb and Dumber To Blu-ray/DVD Combo Pack and a decal cling. I have watched the original movie, and thought it was really funny. I want to see the sequel soon. I have never seen the original movie. I'll have to check it out! Yes! Jim Carrey was hilarious in it. Yes I did watch the first Dumb and Dumber movie. Yes I have seen the original movie lots of times, too funny. I saw the first one, but haven't seen this one. whether or not you've watched the original Dumb and Dumber movie. I have seen both and I love toilet humor comedy! the original dumb and dumber is one of my favorite comedies ever. haven't seen this new one yet but it looks good too. Yes, we've seen the first movie many times, and laugh every time we watch it. I have seen it. I love that movie! Yes, I've seen it a few times. It's funny but dumb. I saw the original in theaters back in 1994 and loved it!! One of the funniest movies I have ever seen!! Yes! See the original. Love Jim Carrey! yes, i saw the movie a long time ago. Yes, I saw the original many years ago. Yes, i have watched the original and i own it. I love Jim Carey and thought he was a riot in the original. I have never seen the original movie. I have seen the original one. I have seen the original. It is a classic. I did see the original. I remember watching the first one when I was a kid. I loved it and wouldn't stop quoting it. I own the first one! Funniest movie ever! I have seen the original Dumb and Dumber movie a couple of times. Yes have watched it many times. I have watched the original many times over. I did see the first movie, and I've watched it several times. Yes, I saw the first movie..it was a lot of fun! Yes I watched the first one. I did not see the original one yet but I will watch it before I watch this one. I've watched the original Dumb and Dumber movie at least a dozen times! Yes, I watch the first one many years ago. Yes I have watched the first Dumb and Dumber movie. Yes, I have seen the original movie and it was funny. No, I did not see the original. I saw the original movie and I thought it was very funny. I remember seeing the original Dumb & Dumber in the theater when it was released. Classic! I watched the first one with my husband. It is definitely his kind of humor. He would be thrilled if I won. Yes, I think I saw the original movie. I saw the first one and husband is dying to see this one. I saw the original movie a few times. Yes, I loved the first one. Can't wait to see this! I can remember going to the movies as a teenager to see this movie. I have never seen this movie, it really looks like a good one that I would want to see. Thank you for having this give away. I have not viewed either. I saw the first one but not the second. Yes the original and have the movie. Visited the Stanley hotel where the hotel scene was filmed in Estes Park and visited Aspen...lol we lived in Colorado so were there anyways. I have not seen the original! I've been looking around for somewhere to watch it though! Yes, I've seen it a few times. Yes I have and I thought it was so funny! I haven't seen the original movie yet. Yes, I watched the original. Can't wait to see this one. I usually watch it at least once a year. I have watched the original Dumb and Dumber. I hope to see this movie sequel soon. I watch the movie and I thought it was hilarious. No, I never saw the original movie. Yes, I've seen he original movie. I can't wait to watch this one. I have watched the original movie more than once.It is hilarious and Jim Carrey was good as always. Yes, I watched the original years ago and loved it. I did see the original movie,I like the movie it was funny!! Yes I have seen the original movie. I loved the Original Dumb and Dumber best, but the remakes are good as well!